Quite sometime back there was a warning from the West Midlands Police for students to be extra vigilant with their laptops and hand held devices as the exams near. It seems that this is the time when most thefts of electronic devices occur, usually from libraries or other communal areas. It was not surprising that most thefts occur when people go for a coffee or toilet break. I mean, it would be awkward to take a laptop to the toilet. 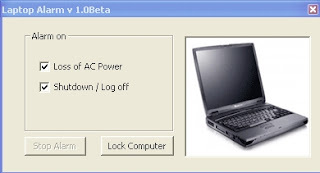 The Laptop Alarm (only 188KB) just might be the perfect solution. The latest version, LaptopAlarm 1.13 fixes a bug in the previous version. - tries to shut off or log off the laptop. - pulls the AC adapter plug out. - pulls out your USB mouse. Just make sure that you are not using your earphones as the alarm is extremely loud. In a place like a library, any attempt to steal your laptop will definitely attract a lot of attention. Just make sure you don't forget and trip the alarm yourself.